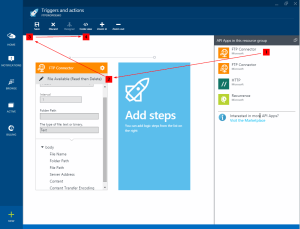 Microsoft has released an update to this issue now showing you the name of the connectors in your resource group. Microsoft recently released Microsoft Azure App Service in preview – which enables you to build Logic Apps. 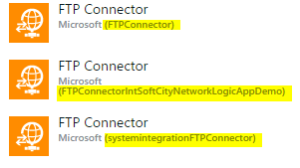 We came across a minor problem while creating and working with logic apps – which connector has which name when having the same type of connector in the current resource group. Let us say you have a logic app that reads from one FTP Server (your internal ftp) and you need to upload the file to another FTP Server. For this scenario we need to have two FTP Connectors in our resource group of the Logic App – in my example I have called them “FTPSourceServer” and “FTPTargetServer”. 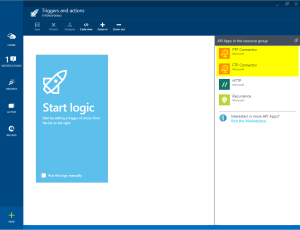 Let’s take a look at the Logic APP triggers and action interface and see how it looks like (see screenshot 1 below). How do we know which of the FTP connectors we see is either “FTPSourceServer” or “FTPTargetServer”, by just looking at the screen shown in Screenshot 1 above? Short answer: In the current version, by 2015-04-13, we can’t by just looking at the designer view (the one on Screenshot 1). Long answer: There is a work around! See “The Solution”. What you can do is to simply add the first in the list to the logic and simply choose the “File Available (Read then Delete)” trigger, save the changes and then switch to “Code View” (see screenshot 2). You have now switched from the “Designer” to the “Code View” showing you the JSON data the logic app needs and uses in order for your logic app to work correctly. In order to find out which of the FTP connector you just added, simply search for the “triggers” section of the JSON file and see the name of the trigger – see screenshot 3. 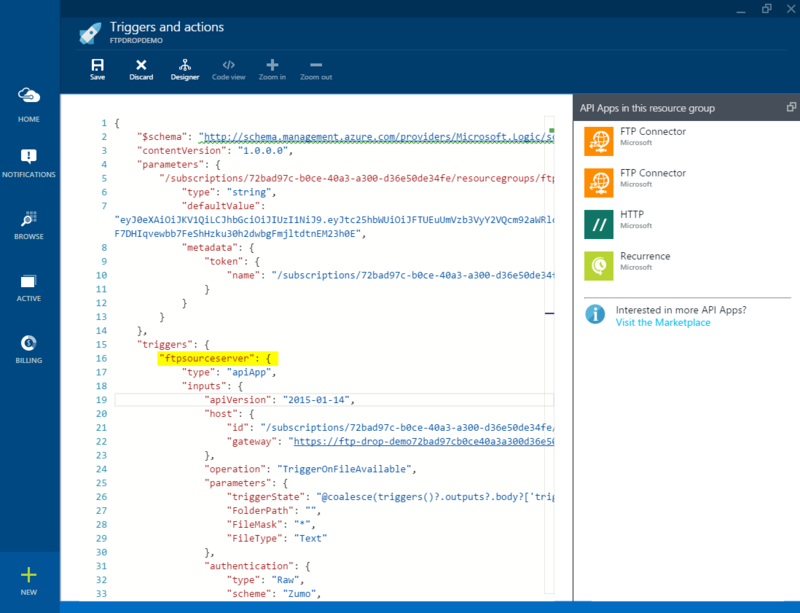 This is of course not the best way and I am sure Microsoft’s Azure team is aware of this issue and gets fixed soon – keep in my mind that the new interface of Microsoft Azure is still in preview as well as API and logic apps!